We understand life insurance can be confusing. Our experts will give you guidance to make sure you find the best deal on the coverage you want. At Quotacy, we make it easy to get instant quotes for term life insurance online. Our process allows you to shop anonymously until you’re ready to buy. And we will never sell or share your information. Plus, all the life insurance companies we work with are best-in-class, financially-secure, and highly-rated by independent consumer protection agencies. We are dedicated to helping you protect your loved ones from start to finish, whether you’re in perfect health, have pre-existing conditions or are an avid cliff diver. Our experts will find the best rates from top insurance companies and compare them for you. And they’re not paid on commission so they can work with your best interest in mind. We’ll also take care of the paperwork and even go back-and-forth with insurance companies. All to save you time, money and stress. Our quoting tool has a sliding feature that allows you to move (increase and decrease) the amount of coverage and the term length. As you make adjustments, your quoted rates change accordingly so you know what you would pay. After you find the numbers that fit your needs, you’ll be given policy options from top insurance companies. And the price for each policy is conveniently displayed so you know the rate you are applying for. Once you have found the policy you want to move forward with, you’ll create an online account on Quotacy.com. And don’t worry, your information is private, and it will never be sold to third parties. After you have finished setting up your account and successfully submitted your pre-application, we’ll email you an EasyApp Intake Form (1-2 pages) to sign electronically (and securely). The online pre-application will only take a few minutes. Once that’s done, we’ll send it to the life insurance company for review. Note: Submitting an application does not commit you to purchase a policy. After your online pre-application has been submitted, a Quotacy agent will review your information to make sure you’re matched with an ideal insurance company. Some companies evaluate factors like health and lifestyle differently, so it’s possible another company will be a better fit. After the review, one of our agents will reach out if they think there are better options available from a different company. They can then show you policies that would match the price of your initial quote. You would then review your options and pick the company and policy you wish to move forward with. During this step, agents will set realistic expectations upfront and work hard to get you the best rate possible by shopping around and advocating directly with the insurer on your behalf. After your application has been submitted to the insurance company, one of their representatives will reach out to schedule a phone interview. They’re confidential and typically last 30 minutes. Since some of the application questions can be black and white, this will be your chance to explain the gray areas in your own words. In addition, it’s important to provide as much information about your doctor(s) and clinic(s) as possible to prevent delays. Most life insurance companies require a simple medical exam. It’s not uncommon for people to want to avoid the hassle of a medical exam, but Quotacy makes it simple. The medical exam is completely free. They’ll even come to your home or office, wherever it’s most convenient for you. The average time to schedule and complete your exam is within one business week. The exam itself will typically take around 20 to 30 minutes where the examiner will simply take your weight and measurements and a blood draw. Fear of blood or needles? Tell your medical examiner. Once the insurance company has your application and you have completed your phone interview and medical exam, all you have to do now is wait. At this point, they will review your medical records. We’ll keep you updated as your application moves through the approval process. If there are any issues, we will contact you and go over your options to make sure you get the best coverage possible. After your application has been approved, you will have 30 days to review your policy. If you have any issues or concerns, you can change it or receive a refund. Make sure to have a valid photo ID or valid resident card available for your medical exam. Also, tell your agent if you have any future travel plans during the processing of your policy (dates and location), to ensure there’s no delay in the initial processing. Why choose Quotacy for your term life insurance needs? 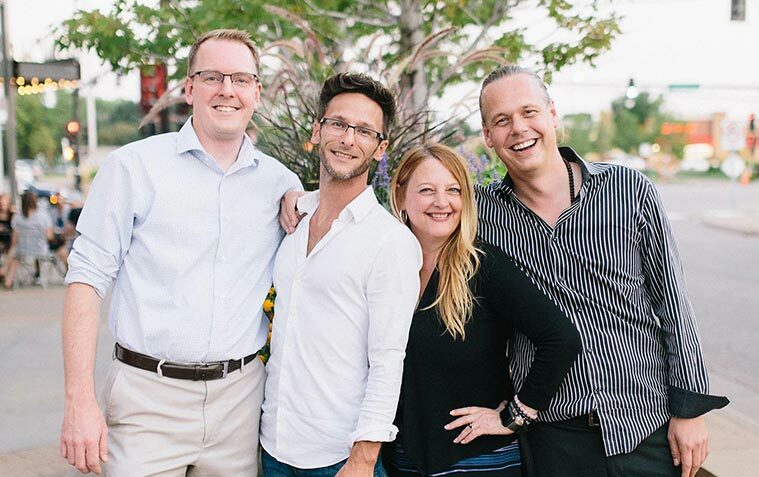 Quotacy co-founders: Ryan Hallett, Jason Nash, Abby Reddy, and Jeremy Hallett. The underwriting process for life insurance is something you only go through a couple times in your life. So, it’s important to choose an experienced guide to lead you through all the steps. Our agents work on salary, not commission. They will advocate for what is best for you. Plus, you can take care of everything online as well as live chat, text, email, or talk with our care team whenever you need help. We’re committed to helping families protect their loved ones with the gift of life insurance. And we would be honored to help you find the best policy that fits your family’s needs and budget. Questions? Call customer support at (844) 786-8229 or text us at (612) 260-4575. Team Quotacy is glad to assist you with your life insurance needs from quote to coverage.